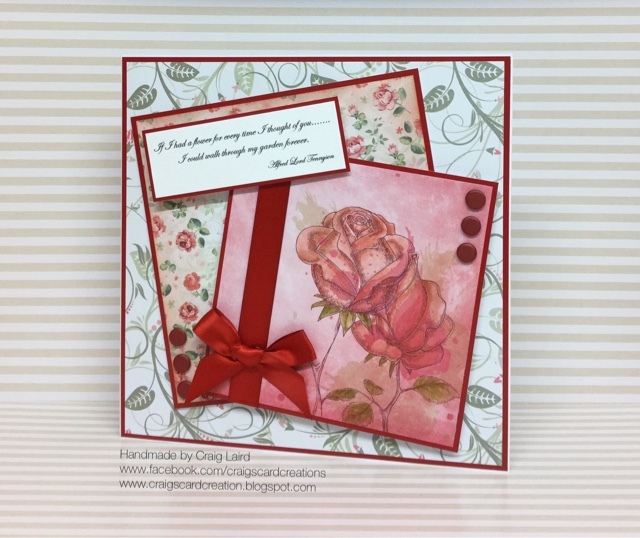 Crafting With Craig: Garden full of flowers 8x8 card. Garden full of flowers 8x8 card. It's been a while since I sat down with a paper pad and inks and just made a card from these elements. I had a lot of fun last night cutting up my 12x12 paper pad and cutting elements out to colour with my distress inks and water brush. I was in The Range early this week and they had these lovely 12x12 paper pads on sale at £2.99 each. Seeing this was a great deal I bought 2 different ones. They are from a company called - Craft Sensations. They are double sided 12x12 papers with some of them having having 4 6"x6" matts on one page for you to cut out. There are additional elements such as borders and speech bubbles. The pad I used was called Romantic Fine Art and is all based around love, or at least the colours are all based around love. I have kept the card based around Love or Romance and kept the colour theme quite simple. I used a 12x12 page cut down to 8x8 and mat and layered on to Poinsettia red Adorable Scorable card stock by Hunkydory Cards. I then attached to my card blank. I cut 2 6x6 squares from one of the pages and distressed the first 6x6 square using Fired Brick distress ink and a distressing tool - the first square being the small rose head and leaves. The 2nd panel was a larger rose head in the bottom right hand corner. I took my non stick craft mat and rubbed some of the Fired Brick distress ink on to the mat and using a water brush, I coloured and gave more detail to the rose head and leaves. I added extra colour/shade where needed to give it dimension. The joy of this image is it has shaded areas already on the rose head/petals so it was easy to just add extra highlights where the shading was already situated. I used Peeled Paint distress ink and a water brush to add extra shading to the leaves of the rose. You can see from the first picture below the difference between the rose that is on the page and the rose once I have added extra colour to it. (Rose on the left is the rose I coloured). 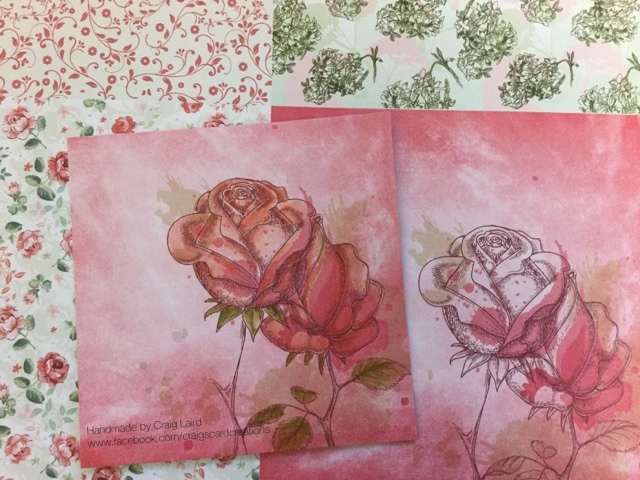 Both the 6x6 squares have been matter onto Poinsettia red Adorable Scorable and the first mat where I distressed the edges has been attached to the card by using 1mm foam pads (or 1mm foam on a roll) this adds slight dimensions and helps detract from the card base. The additional layer with the main rose design has a piece of 16mm double faced satin ribbon by Stix2 wrapped around the left hand side. This mat has been attached to card using the 4mm sheet from the A4 foam pad sheet. This really helps to give dimension and helps separate the 2 6x6 layers, each given them their own reasoning for being on there. I then tied a bow in the same ribbon and attached to the bottom using silicone glue. Then I added 6 pearlised red card candi - 3 on each side. When it comes to card candi, I personally find it so much easier to attach the foam pads to the back of the candi first and then attach it to the card, that's just me. The saying is a saying I read a few years ago, and since then, it has alway stuck in my head, so as a rose is a flower, I thought it was very appropriate to add this typed phrase onto the card. I attached the sentiment using 3mm foam pads but I double decked them so the sentiment stood out the most height wise. I had so much fun and really enjoyed myself making this card by playing with the paper pad and inks. It's something I will make sure I do more often. Romantic fine art 12x12 paper pad - Craft Sensations. Poinsettia red Adorable Scorable - Hunkydory Crafts. Fire brick distress ink pad - Ranger. Peeled paint distress ink pad - Ranger. Medium water brush - Kuretake. 9mm double sided tape - FPAL2732950. 5mm x 5mm x 3mm foam pads for card candi - S57083. 50mm x 1mm x 50m roll of foam tape - GPAL11035150. A4 foam pads sheet - S57182. 16mm red satin ribbon - S57209. Pearlised red card candi - Craftwork Cards.